Bloodworth Law, PLLC, is pleased to announce that Partner J. Kemp Brinson has been named to the 2019 Super Lawyers list for his work in Employment Litigation. Less than 5% of practicing lawyers in the U.S. are selected to Super Lawyers annually, one of the most sought after distinctions in the legal profession. “It’s an honor and I’d like to thank those who supported me in earning this award,” Brinson said. While firms across the country are statistically fortunate to have even one partner who makes the final cut, Bloodworth Law, PLLC, defies the odds by having two attorneys at its firm included in the prestigious attorney-rating publication. Managing Partner of Bloodworth Law, attorney L. Reed Bloodworth was selected to the 2019 Super Lawyers for his work in Florida Business Litigation. Super Lawyers publishes its annual listings of top attorneys in each state which is based on peer nominations, independent research into a dozen criteria of success (from major case results and scholarly contributions to community and professional involvement), and peer-review evaluations. 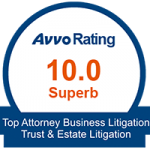 Super Lawyers®, a part of Thomson Reuters, is a rating service of outstanding lawyers from more than 70 practice areas who have attained a high-degree of peer recognition and professional achievement. Bloodworth Law, PLLC, is a Winter Haven, Florida, and an Orlando, Florida, business litigation, trust or probate litigation, and employment litigation law firm founded by attorney Reed Bloodworth in 2016. Who’s the Best Attorney for Your Lawsuit?